Senator Rick Scott was in Southwest Florida Monday to ask the federal government for more than $200 million to protect Lake Okeechobee and the Florida Everglades. 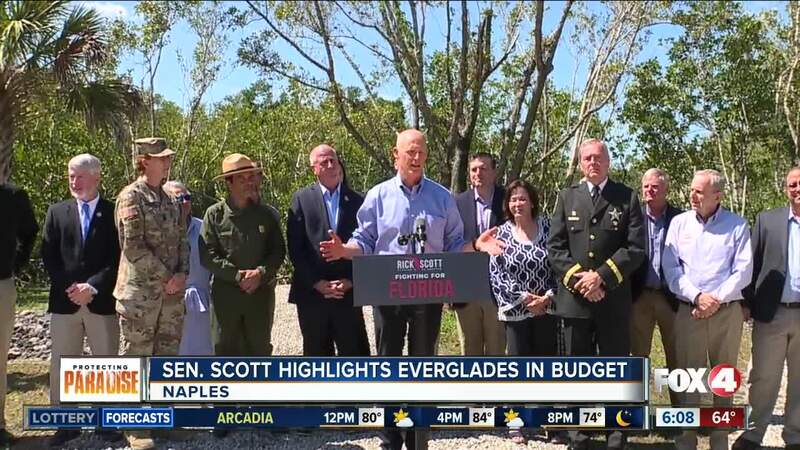 NAPLES, Fla. -- Senator Rick Scott was in Southwest Florida Monday to ask the federal government for more than $200 million to protect Lake Okeechobee and the Florida Everglades. Senator Scott says he also has plans to fix the Herbert Hoover Dike. This plan says fixing the dike is crucial for water quality in the Everglades and surrounding estuaries, and will help curb algae blooms. "We need to get the dike money through President Trump and Congress, which is a big deal. The dike will be finished by 2022...we’ve got to keep doing these things," said Scott. Senator Scott says this funding will build on the more than $2 billion dollars he says he invested when he was governor.